"Meet the HENRYs: The Millennials That Matter Most for Luxury Brands, by Pamela N. Danziger "
Retail expert Pam Danziger examines trends and profiles emerging disruptive brands that millennial HENRYs are drawn to, and she explains how many of these innovative brands are setting themselves apart from the traditional top-tier luxury brands. For the foreseeable future, millennial HENRYs (High Earners Not Rich Yet) will be the consumers that every brand manager, marketer and retail executive will need to know well. This subset of the largest generation of Americans, earns between $100K and $250K--the income cohort that accounts for 40 percent of all household spending. Most important however, these are the consumers who are on track to become the ultra-wealthy ($250K +) of the future. 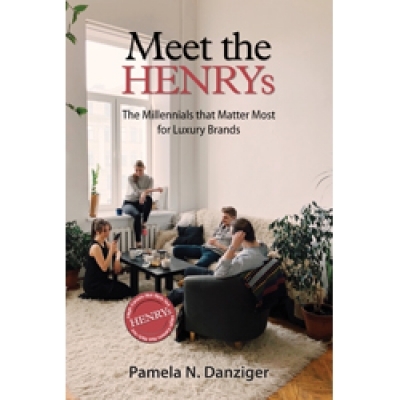 In this forward-looking book, retail expert Pam Danziger examines trends and profiles emerging disruptive brands that millennial HENRYs are drawn to, and she explains how many of these innovative brands are setting themselves apart from the traditional top-tier luxury brands. Danziger also takes you on a deep-dive into the steps the smartest of the traditional luxury brands and retailers are taking to keep up with a new generation of consumers who are anything but traditional in their approach to luxury spending. In addition to explaining why they are the customers to watch and learn from, Danziger reveals 15 qualities and types of luxury that appeal to these younger trend-setting HENRY shoppers. From 25 in-depth case studies of exemplary products and brands, you’ll gain new perspectives on brands that deliver on convenience, simplicity, health and wellness, discovery, authenticity, and of course, performance. This road map to the future of the luxury market will leave you with SIX transformative approaches to brand positioning that will help you create a brand that HENRYs love.